What does the word "stared" mean in the sentence: "The children stared at the cookies on their plates." What is an antonym (opposite) for the word "enormous?" What is a synonyms (word that means the same) for "good" in the sentence: "They smell as good as your Grandma's." Who do you think range the doorbell after Grandma arrived with more cookies? Grandma made enough cookies to share. Talk about something you share with your friends. Ma baked 12 cookies to share. How many different ways can you evenly divide 12 cookies to share with your friends. Ma baked cookies in the oven. Think of other foods that can be baked in the oven. Think of different types of "snack" foods you like to eat. What is your favorite type cookie? Name as many different types of cookies as you can. *Pair this book with the popular song, "Who Stole the Cookie from the Cookie Jar?" (YouTube Link Provided). Thank you for visiting my site! 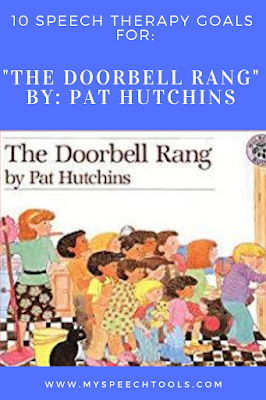 I want to offer you two of the comprehension graphic organizers included in The Doorbell Rang BOOK COMPANION available in my TPT store. Speech Therapy Goals and Activities for "Boo Hoo Bird"
To purchase a gently used copy of The Doorbell Rang, you can also visit Thriftbooks by clicking on the following link: Used books for as low as $3 each (A Thriftbooks affiliate link). Click HERE to visit my TPT Store for MORE Pat Hutchins book units and other literacy resources.